If you're dealt a pat 19, you feel pretty confident with your odds against the dealer, don't you? There's no reason to not feel confident, a 19 is a hand that has a positive return regardless of what the dealer is showing. The question that arises because of this is as follows: what if you have a 9? 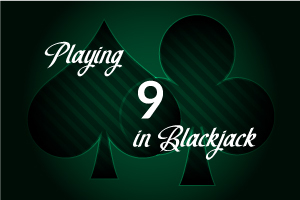 The odds of drawing a 10 or A are 5/13 or 38.4%, very good odds in the game of Blackjack. So it's a good possibility that you will be drawing to a 19, or even a 20. Given this scenario, should you double down? As always, we will look at this assuming that you are playing in a multiple deck game where the dealer stands on a soft 17. Standing on a 9 is definitely out of the question since any card that you draw will improve your hand. Our options then are either hitting or doubling down. Let's start with hitting. If the dealer is showing a 2, over a long enough period of time, you will average a $0.07 return for every dollar you invest in the hand. For 3 through 6, you will have a $0.10 to $0.20 return. On the dealer's 7 there is a $0.17 return and on 8, a $0.10 return. 9 through A has a negative return of $0.05 to $0.15 on the dollar. Now let's compare those numbers to doubling down in order to determine which is more fruitful. Doubling when the dealer has a 2 exposed has a return of $0.06, a penny less than hitting. Hitting is definitely the way to go in this case. For 3 through 6 the return is $0.12 to $0.32. In this instance, doubling down makes a good deal more sense (and cents!) over the long run. 7 has a $0.10 return, again, much less than the return on hitting. There is a return of -$0.02 on the dealer's 8, so you want to avoid doubling. 9 through A has a large negative return of $0.30 to $0.43 on the dollar. To minimize damage, you will want to hit. So here's the rundown: double a 9 ONLY when the dealer has a 3 through 6 exposed, otherwise hit.